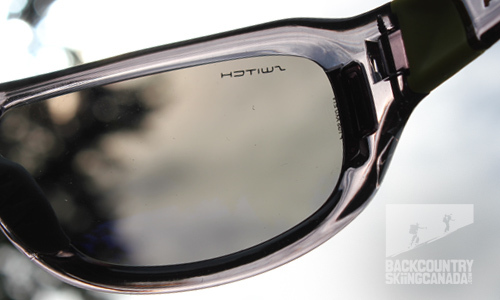 Switch Sunglasses has revolutionized the sunglass industry with their innovative Magnetic Interchange Lens System. It's now super easy to switch lenses suited to any light condition no matter what your adventure and 'See right in every light'. 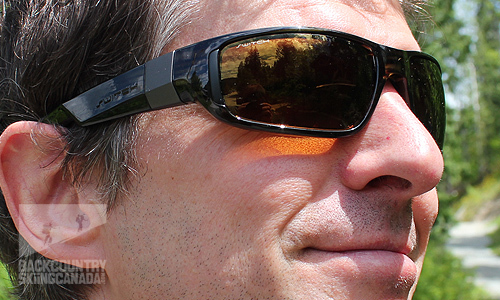 It’s been a long time since a manufacturer of sunglasses has impressed me with technology. Aside from polarized lenses, there hasn’t been a lot to celebrate in terms of developments in the realm of sunglasses in the past while. Most “improvements” have just been gimmicks and, while a good pair of sunglasses do protect your eyes from the suns rays, ultimately they’re just bracelets for your face – an accessory that is more about how it makes you look than how it performs. That all changed a month ago when I was introduced to Switch Vision, a young company based in New Jersey that has redefined the interchangeable lens market. 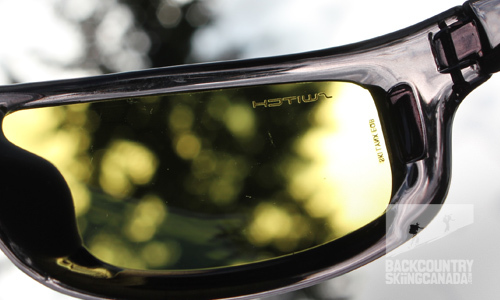 We all know that certain coloured lenses work well in different light conditions (for example, I love my amber lenses when biking in deep forest because they increase contrast and define contours) but carting around three or four different pairs of sunglasses is a pain. Not to mention those who wear prescription lenses and have to have multiple pairs of glasses for every endeavour. Over the past decade, manufacturers have come up with a myriad of systems for swapping lenses in the same frame: everything from a “convertible” frame that allowed you to slide the lens out the top, to a “twist-and-pop” system that always felt like you were either going to snap the plastic or the lens. Switch Vision recognized the problem: “Between carrying around multiple, bulky sunglasses, and pulling and prying mechanical interchange lenses in and out, we felt there had to be a better way,” reads their literature. “Then it came to us: Magnets! So we built a prototype with embedded magnets in the sunglass lens and frame to test our theory.” A simple solution and one that I looked forward to testing when I received the Axo, with two types of lenses, the Lynx, with three kinds of lenses and the B7 with four lenses. The technology is the same in each so for the purposes of this review I’ll concentrate on the Axo (which I wore more often because, well, it looks better on my face). 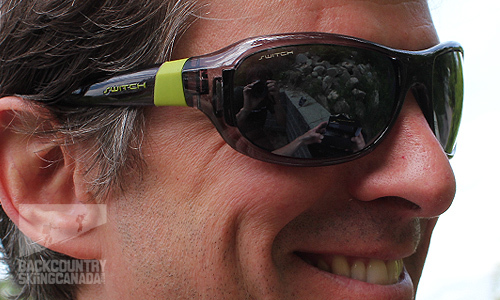 The Switch Vision Axo Sunglasses with lenses. The removal of the lens is as simple as a light pull. A close up of one of the Switch Vision magnetic points on the lens. 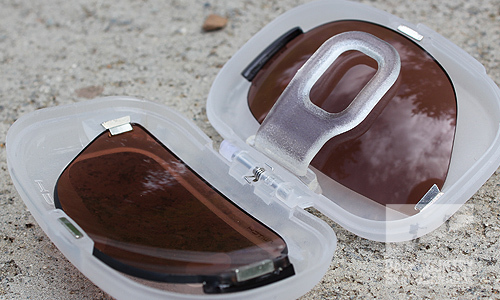 The Lens carrying case also uses magnets to keep the lenses safe and sound while not in your glasses. 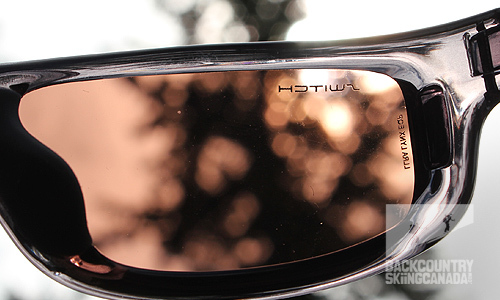 The Grey Reflective Silver Lens. The Low Light Rose Amber Lens. 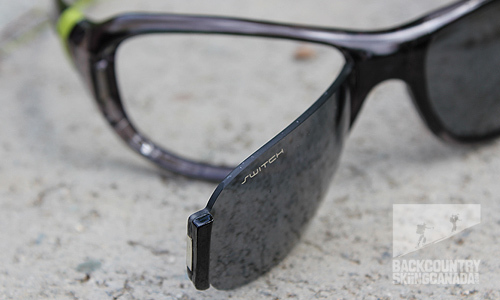 Like everyone who first hears about the magnetic technology of the Switch sunglasses, I had to ask, “Do the lenses pop out?” After all, they aren’t really being seated into the frame at all: they’re just stuck to it. Two magnets are embedded in one frame socket (one near the nose piece and one near where the arm meets the frame) and there are two magnets on either side of one lens (which do not impede your vision incidentally). I was blown away at how strong these magnets are considering they’re about the size of the nub on a pen! When I held the lens about a centimetre away the magnetic forces kicked in and it was yanked into place. To remove the lens, it’s a simple matter of pushing them out. No snapping, twisting, pulling, prodding. Just slap ‘em in and go. 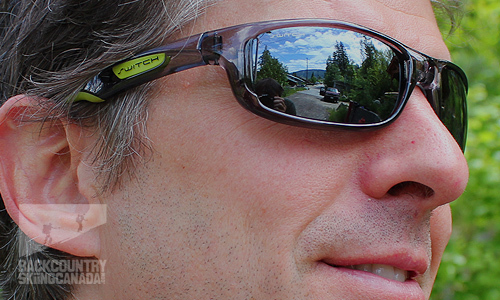 The first time I wore my pair of Switch Axo glasses we were on a long cross-country ride near Kaslo, BC, and I loved how I could easily swap out the lenses (amber for the the heavily-forested sections and polarized for the the open air, and extremely sunny, sections.) The second time I took them out biking, I proved the magnets are indeed incredibly strong after endo-ing off a stunt and crashing through the brush head first. I hit the ground with enough force that the glasses slide off my nose – but the lenses stayed in place. Speaking of the lenses, Switch Vision manufactures 11 kinds of them (from mirrored to green to yellow) and they also offer prescription-specific ones. According to the manufacturer, each lens is coated with TriGuard which is said to make them “scratch resistant,” “water repellant,” “shatterproof” and “smudge resistant.” I can’t speak to the first three as I haven’t owned them for long enough but I definitely noticed fingerprint smudges the few times I swapped the lenses without using the microfiber cleaning rag. 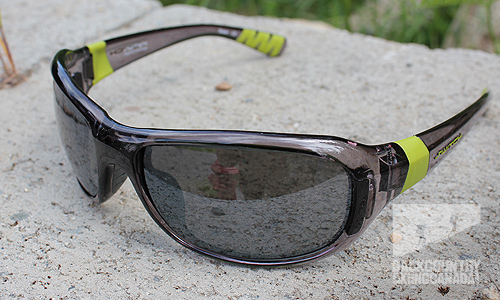 Aside from the ease of switching out lenses, I also liked the fact that the Switch Axo glasses didn’t fog up during any of my rides – even though I was out in the middle of the summer during some humid days. There was enough airflow around the nose piece and under the frame to ensure the lenses stayed clear yet I didn’t feel like my eyes were being buffeted by the wind. Another selling feature is the thermoplastic nylon frames, which are extremely durable (as evidenced when I practically landed on my nose during that one wipe out mentioned above) yet they’re light. I never suffered from a sore nose bridge despite wearing them for hours at a time. The shape of the frames allowed for a snug fit without pinching and the rubber on the nose piece and the ends of the arms increase their grip on your head and stabilize them. The only downside of the Switch sunglasses has nothing to do with the glasses at all but rather the hard case they came in. The zipper broke almost immediately on one of the cases and, unfortunately, there isn’t anywhere to put the lens pod, which holds your second set of lenses. But, really, this is a minor detail and doesn’t have anything to do with the sunglasses themselves. 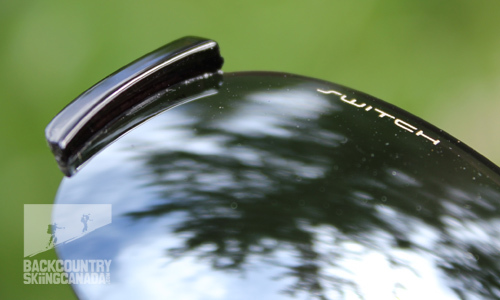 In fact, I don't have anything negative to say about the Switch sunglasses themselves. Even the price is right: the Axos I reviewed cost US$149 and that includes two sets of lenses. I am suitably impressed at how Switch Vision has made huge strides in the sunglasses market and I'm giving them a rating of 9.5/10. 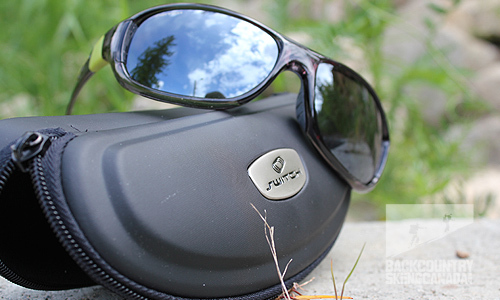 If you are interested in Switch Visions latest creations click on over here to read our review of their Pathfinder and Stormrider sunglasses which have magnetic activity and climate eyecups to essentially turn your sunglasses into goggles! Everything. 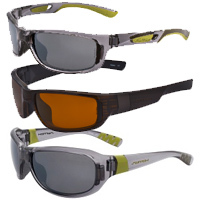 The Switch sunglasses incorporate the best technology to hit the market since polarized lenses. The magnetic interchange system is easy to use yet strong, and the frames are rugged, yet light. The hard case could be improved – the zipper needs to be stronger and there should be a pocket in which to put the lens.